There was once a time when the bicycle’s success didn’t seem inevitable, and it looked as if we could end up with something wholly different. In the 1800s, human-powered vehicles—velocipedes—came in a bewildering array of shapes and sizes. There was the Penny Farthing with its massive front wheel and a tendency to kill the rider in ‘headers’. There were Boneshakers, constructed from wrought-iron and about as comfortable as they sound. There were steam velocipedes, because they were Victorians and they had to get steam involved somehow. There were velocipedes with three wheels, or with six, or with space to carry your goodly wife. For sixty years, fad after fad took the vehicles in hugely popular new directions, becoming the must-have items for the early adopter. Then it all stopped. 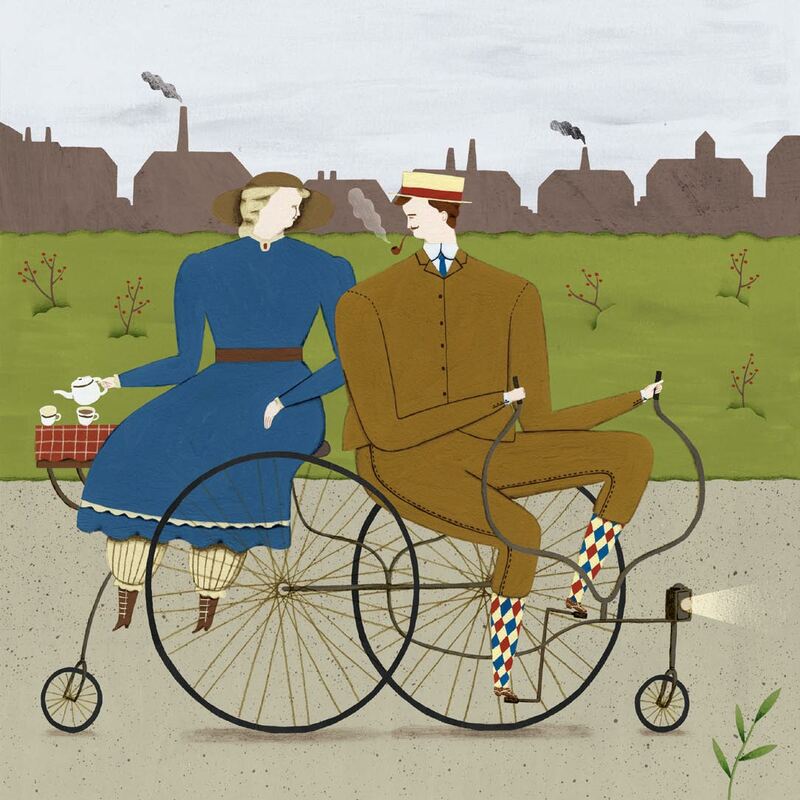 The safety bicycle was created in 1885, and its sensibly-sized-and-numbered wheels prevailed. It had achieved perfection, and bicycles have been largely the same for a century. The demise of the Penny Farthing and the Boneshaker seems inevitable in retrospect. Of course the wheels should be the same size. Of course the tyres shouldn’t be made out of iron. Of course the rider’s feet shouldn’t be several feet off the ground. But who knows what velocipedes would look like now if people had continued to develop them? The history of transport is littered with vehicles that came close to being dominant but faded away, supplanted by something faster, safer, or cheaper. You can see it with the steam car, or the electric car, or even the Amphicar, the part-car, part-boat vehicle that became a fad in 1960s America despite being created by an ex-Nazi war criminal inspired by the SS’s Schwimmwagen. To look at them now is to look at an alternate history. They were vehicles that people saved up to buy, hoping to be part of something new. The life’s work of talented designers and engineers, they were created in the spirit of invention. Now they sit in museums, robbed of the noble purpose of their creation: to take people to where they want to go. What’s sad isn’t that the vehicles didn’t survive, but that what led to their creation was so quickly forgotten: the inspiration, the hard work, the hope. They are failures, undoubtedly, but they are beautiful failures. The Victorians believed that science could accomplish anything, and their hubris was coupled with a rigid sense of duty. It was this public-spiritedness, along with cholera outbreaks and increasing space issues, that led Sir Richard Broun in 1849 towards one grand objective: a place to store all of London’s dead, forever. On Broun’s insisting, Parliament set up the London Necropolis and National Mausoleum Company. They built the largest cemetery in the world in Brookwood, Surrey, and a special line, the London Necropolis Railway, to carry funeral trains there from Waterloo. The Necropolis train held up to 48 coffins and their funeral parties, and was split into two sections, one for Anglicans and another for non-conformists. The train was divided into first, second and third class travel, with conditions extending from the mourners to the storage of the coffins. The groups each had their own platform and part of the cemetery (the Anglicans got the sunny bit). The occasional carriage filled with drunk mourners aside, there was a dignity to the Necropolis train. A final train journey has the sombreness and pomp that a good funeral needs, and it’s quite beautiful, in its way. In the end, the Necropolis train was a victim of the very progress that had once made it necessary. 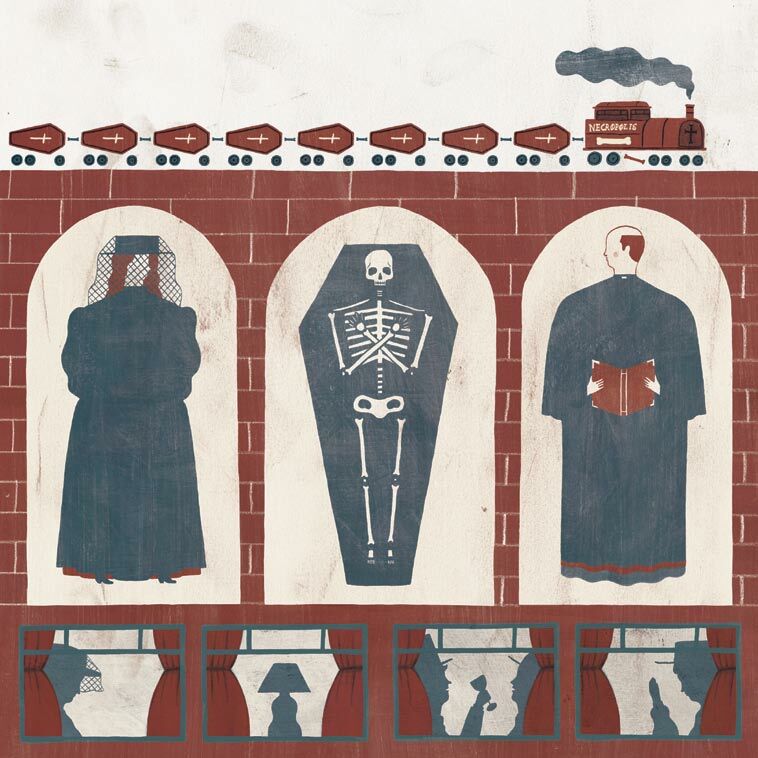 The invention of the automobile made a funeral train unwieldy and inefficient in comparison, while the 32 cemeteries that opened in London during the line’s first twenty years removed the need for a sprawling necropolis away in the country. The number of trains run fell and fell over the ensuing century until, one night during the Blitz, the London station and the train itself were destroyed in a bombing raid, forcing the closure of the line. After the war ended no one saw the value in rebuilding it: the Victorian idealism of the London Necropolis and National Mausoleum Company was dead, unmourned. Buckminster Fuller has a resumé full of things that would be the life’s work of someone else. He invented the geodesic dome. He developed a cheap, energy-efficient house that could be constructed from kits. He created a new type of world map that was less distorted. He experimented with a sleep cycle where he would sleep for two hours a day. Bucky, as he called himself, was not just ahead of his time, he seemed to operate on another plane entirely. The downside of being on your own plane of thinking is that often your work will be too different to be accepted. One of Fuller’s more notable failures in this regard was his Dymaxion Car. Designed in 1933, the Dymaxion was a fast, efficient three-wheeled car that held eleven passengers and was twenty feet long. With its teardrop shape, two front wheels and a single rear one working like a rudder, the car was meant to mimic the movements of fish. Fuller had anticipated that one day the car would also be able to fly, once the appropriate alloys and engines had been invented. Deeply concerned about the earth’s finite resources, Bucky was one of the first environmentalists, dedicated to inexpensive, efficient housing and transport. What Fuller most wanted was for the world to be sustainable and to do more with less. He called it emphemeralisation, and was a model of it. He had hoped the car design and other inventions under the Dymaxion umbrella would be the first phase of a social revolution. It wasn’t to be. 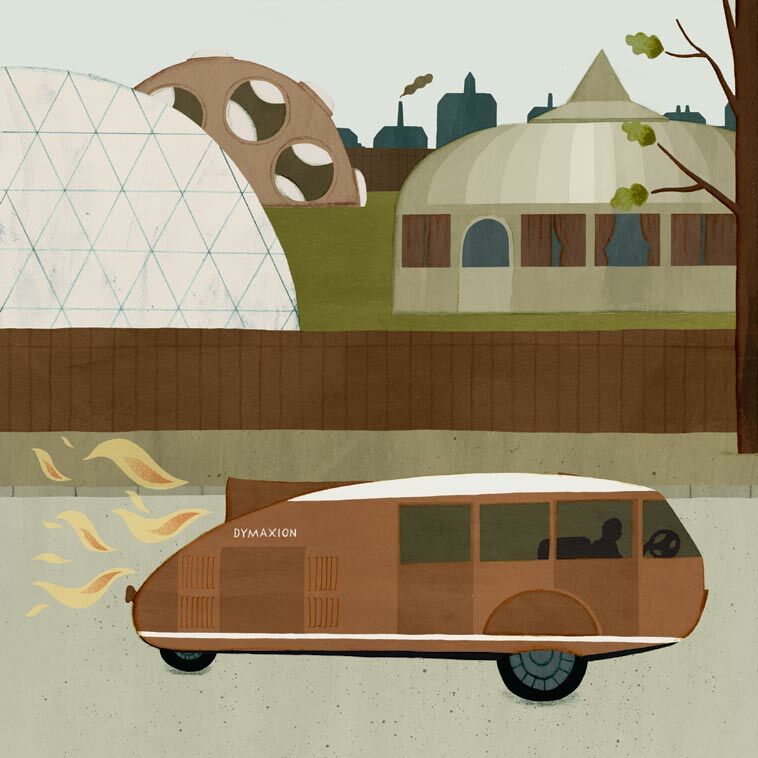 Like so many of his conceptions, the Dymaxion Car never reached fruition: the prototype crashed on its way to the Chicago World’s Fair, killing the driver and two passengers. The press blamed the car’s steering, Fuller blamed another vehicle, and the investors fled. Eventually Bucky moved on too: there would be other ideas. The life of the dirigible has been eclipsed by its death. While there were worse disasters before it, and most countries had already given up on airships as a viable method of transportation, the crashing of the Hindenburg has become one of the key images of the twentieth century. To watch the newsreel footage along with the sound of radio announcer Herbert Morrison breaking down in tears is still a surprisingly emotional experience, with a power that surpasses the whimsy and adventure with which the dirigible was first conceived. 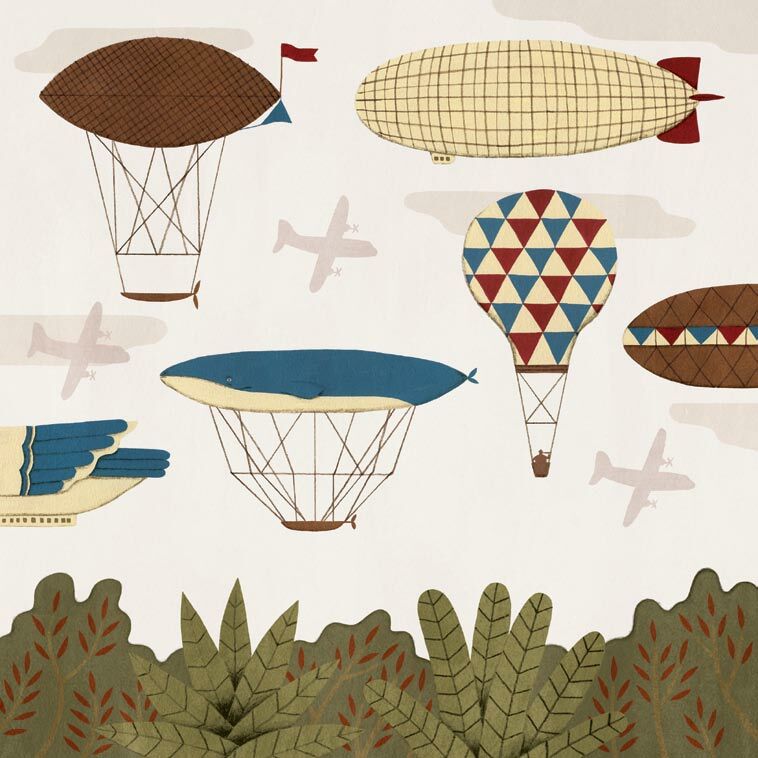 The hot air balloon became a craze in the summer of 1783, and the skies of European cities were dotted with craft. Its development was dominated by the French and British: the French were engineers and scientists, while the British were lone adventurers seeking fame and fortune. More comfortable and less turbulent than contemporary aeroplanes, by the 1930s dirigibles looked like they might become the primary form of air travel. The British planned for a vast air network throughout the empire, Count Von Zeppelin’s eponymous craft was popular and widespread, and the Empire State Building was built with a dirigible mast optimistically attached. It couldn’t last. The reason that the dirigible failed is simple: for all its glamour and advantages, the aeroplane was more efficient, economical and safe. It’s sad that the dirigible has been overshadowed by its demise, because it was the most romantic of vehicles. Henri Giffard invented the steam-powered version, and wrote in his journal during his first trip, “How marvellous to be free of all that which makes you cling to the ground!” He and his peers believed flying would allow them to have thoughts that no-one had thought. They hoped it would make them better people. Long before the infamous crashes, its use in wars or the rise of the Nazi-sponsored Zeppelins, there was the concept that you could step onto some rickety craft and be carried up into the clouds, floating. It was May 27th, 1930, and the former British naval ship, the Ready, sat off Nonsuch Island, Bermuda, awaiting the maiden voyage of the Bathysphere. Its two-man crew were also its creators: the naturalist William Beebe and the engineer Otis Barton. They climbed into the cold, dark sphere, and a 400-pound door was bolted behind them. A curator at the Bronx Zoo, acclaimed ecological author and friend of Theodore Roosevelt, Beebe was a household name, his stormy relationships with ichthyologists gaining similar attention as his theories on pheasant evolution. 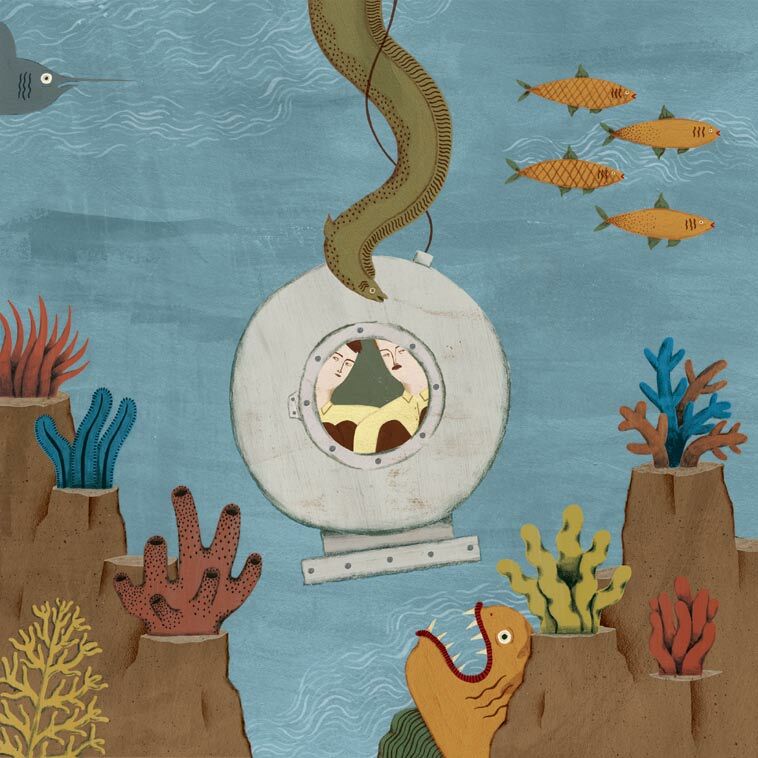 Frustrated by the inadequacy of dredging, he hoped to explore the ocean in an advanced diving bell. He was accosted by Otis Barton, a wealthy young engineer with dreams of deep-sea exploration and plans for a spherical craft. Beebe let Barton pay for the bathysphere’s construction, and a few years later they were sitting in their invention, from which they could not escape, as it was lowered into the black Atlantic. Four summers and around thirty journeys passed. The pair fought seasickness and a leaking craft to dive half a mile down, further than anyone had before. They saw strange new species, and the natural habitats of fish that had only ever been found dead in nets. Beebe would boast that only dead men had sunk deeper. It was deep enough that they were the first people to observe the disappearing frequencies of sunlight, in an ocean that turned violet before their eyes. After four years and with the Great Depression rendering further use difficult, Beebe moved back to the safer and cheaper helmet diving and the Bathysphere went into storage. Other people used the technology they pioneered, but none quite captured the imagination in the same way. Something was lost: the idea of being alone, deep beneath the sea, risking death in the name of discovery. It would be almost forty years before another group of explorers made people feel the same way. They would have crew cuts, and one of them was called Neil.